Atom Hotel is an interactive webdocumentary that allows the viewer to explore the invisible world of atoms. 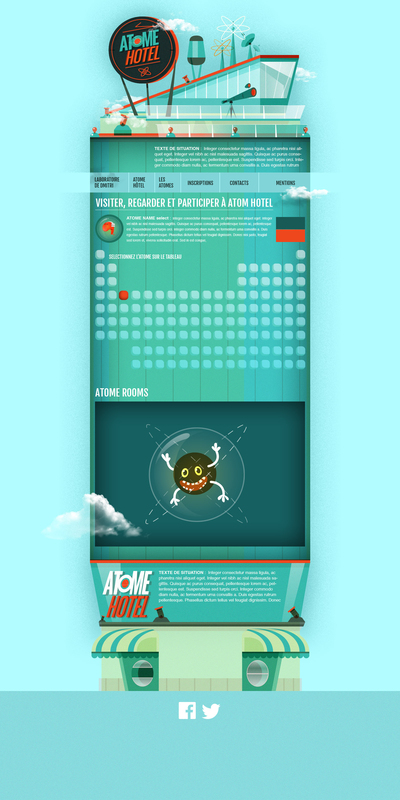 Atom Hotel brings to life the elements via an interactive periodic table where fascinating true stories are hidden. Atom Hotel showcases physical matter from different perspectives, stimulating the viewer into thinking about what lies within the materials we use, the planet we inhabit and share with other life forms, the universe we contemplate on a starry night… Short documentaries from varied sources make up an interactive logbook showing how mankind uses (and abuses) chemical elements. Want to have a look at our video ? Everything will be finish and online in a year. But we think about you and your curiosity, and made a teaser! Discover the 18 Fluor on the back of this page. What about your favorite atom ? You can e-mail him about your favorite atom : why him, why you like this particular one ! He will welcome your help ! You could follow Dmitri in Facebook and Twitter.